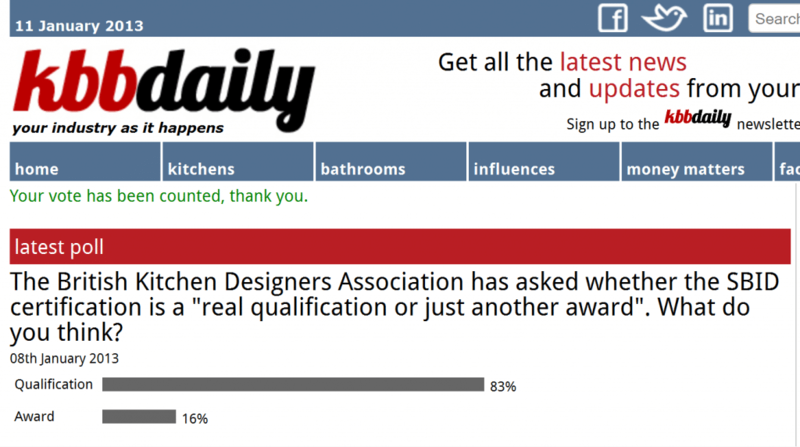 When the BKDA asked the question on the KBB Designers Forum on LinkedIn: “Is SBID offering a real qualification or just another Award?” it was put to the test by a poll on an e-magazine. The poll began four days ago on kbbdaily, which is part of the German publisher Hubert Burda Media, which also includes Essential Kitchen Bathroom Bedroom, Your Home and Essential Kitchen & Bath Business in the UK. After four days voting the answer was very clear with 83% of the voters confirming that the SBID accreditation was a real qualification – Burda Media’s Philip Hurst, who works on kbbdaily, told us that the site has 4500 unique visitors each month and that this poll was the biggest response of any that they had ever run, with over 100 voters from the industry, expressing their view over the three days.